After taking a look at the classic Lovecraftian tale Call of Cthulhu last week, I thought it’d be good to write up another blog on perhaps my all-time favourite story from Lovecraft that I have read so far, The Dunwich Horror. 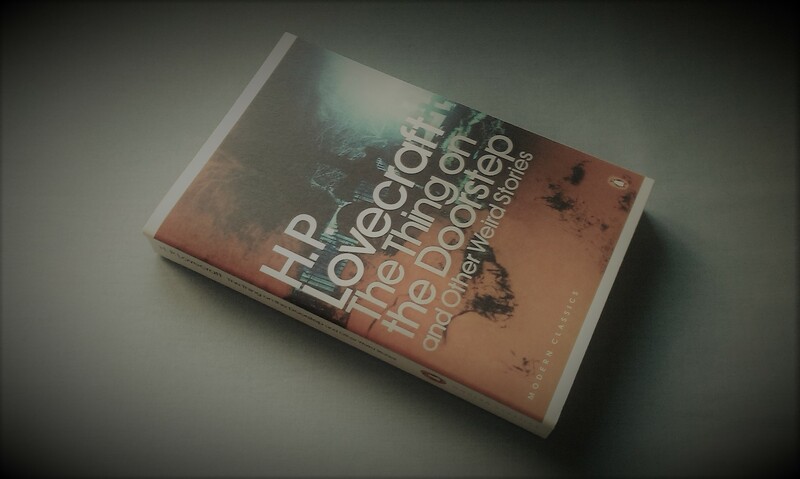 Another story that I first read in the summer of 2012, while Call of Cthulhu was a little surprising to me in being so disjointed and just not what I had been expecting at all, Dunwich Horror was a much more conventional story to me, I found myself instantly enjoying it for what it was. I mentioned in my Call of Cthulhu blog how much better an introduction to Lovecraft’s work this story would be, and I definitely stand by that here. It’s a more conventional story, for sure, but it gives you a better idea of the way Lovecraft writes, for instance his academic types as heroes, his wonderful word-painting when it comes to describing these otherworldly monsters. The Dunwich Horror is definitely my favourite of Lovecraft’s stories that I’ve read so far, though I do admittedly have a lot of them that I’ve not yet read! But it’s highly worth getting a copy – the Penguin Modern Classics edition has also got a few other worthy mentions, including the delightfully creepy Thing on the Doorstep! Well worth a read! Author spalanzPosted on May 31, 2014 February 24, 2017 Categories LovecraftTags Cthulhu, horror, Lovecraft, supernatural, weird tales, Yog SothothLeave a comment on Bigger’n a barn! Ah, time for some more reminiscence, I think! Following the death of Llywelyn, there was something of a power vacuum until his grandson, Llywelyn ap Gruffudd, ‘the Last’, consolidated his power, imprisoning his brother Owain in a castle with a round tower, widely believed to be Dolbadarn. During the conflict with Edward I, following the death of Llywelyn in 1282 his brother Dafydd assumed power and was driven back into Snowdonia, eventually governing from Dolbadarn. Dafydd was eventually caught, and the capital punishment of hanging, drawing and quartering was invented for him. 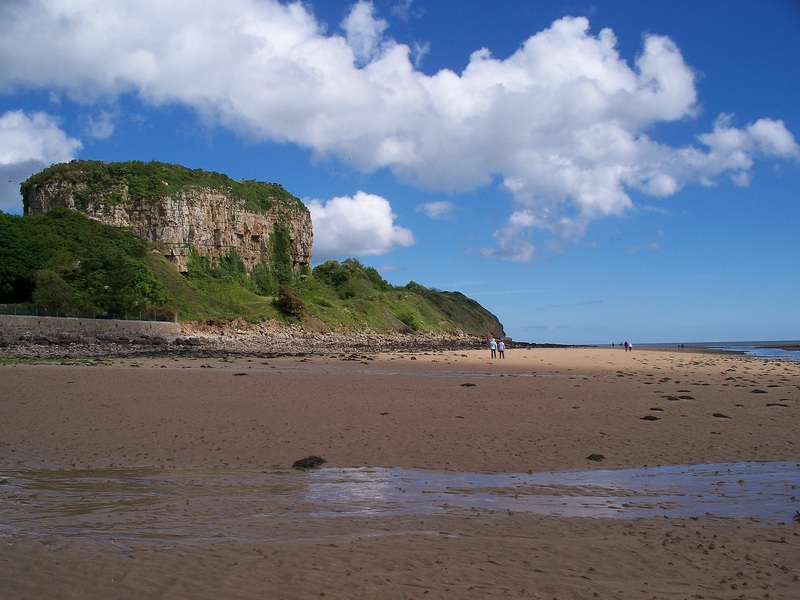 Edward built a series of castles across Wales to assert his dominance over the region, centred on Caernarfon, and while some effort was made to maintain these native castles, eventually English rule was centred on the new castles and these smaller buildings were forgotten. The castle ran to ruin following this, and formed a popular subject for painters during the Romantic revolution of the nineteenth century. It’s easy to see why, too, given how picturesque it is today! Come on down to Arkham! It’s time for Arkham Horror! Arkham Horror is a co-operative game for 1-8 players, much like it’s younger sibling, Eldritch Horror, where you take on the role of an investigator to battle the evil of one of the Great Old Ones. 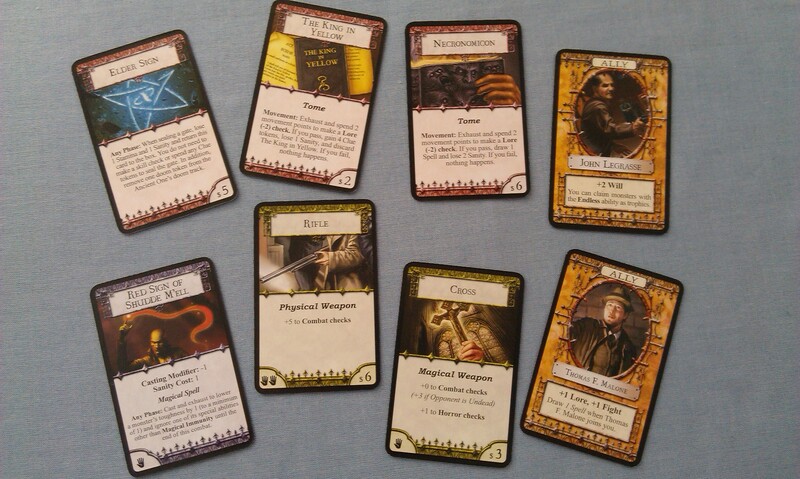 There are eight of the Elder Gods in the base game, including Yig, Yog-Sothoth, Hastur and Cthulhu himself, of course. Over the course of the game, the investigators are tasked with preventing the Ancient One awakening, which will happen in a variety of ways, usually by letting too many gates to Other Worlds open across the board. If the investigators can seal six gates, they win; if there are either at least five gates open, or if the Ancient One’s doom track fills up, a final battle is triggered between him and the investigators. 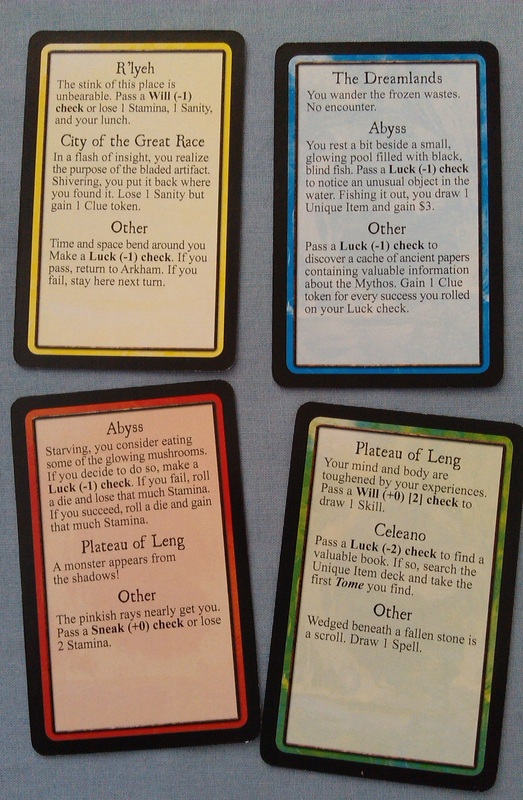 At the start of the round, a Mythos card is revealed that will trigger several effects, starting with a gate opening to one of the Other Worlds that are arrayed along the edge of the game board. 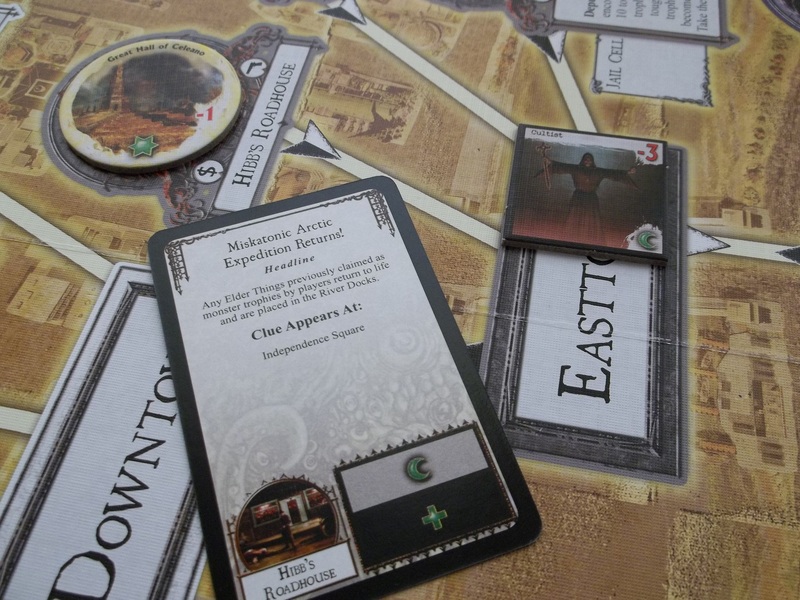 In addition, clue tokens are spawned around the board, which aid the investigators in their struggle. When gates open, they also bring monsters out; monsters have dimensional symbols on them that correspond with those on the Mythos card and, when revealed, can cause the monsters to move about the board. Finally, Mythos cards have an effect that can either trigger once, provide an ongoing effect, or else act as ‘rumor’ effects that force the investigators into a side quest before they cause something awful to happen. Generally, Mythos cards are awful, after all. Each location on the board has a broad theme such as providing money, or items, or spells. However, as shown on the card above, investigators must test one of their attributes in order to gain the money, items or spells. 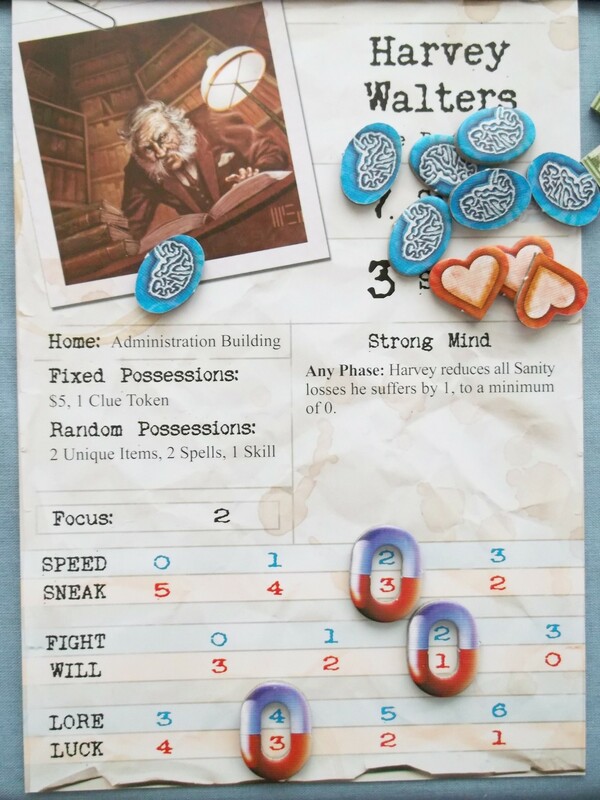 The investigator sheet shown above shows Harvey Walters to have a Lore skill of 4, which means he rolls 4 dice when making a Lore skill check. However, if he were to be making the skill check as shown on the above card for Ye Olde Magick Shoppe, the Lore check is -1, so he rolls one less die. Successes are scored on a result of a 5 or a 6, but throughout the game the players may become either Blessed, which makes a 4 a success also; but also Cursed, which means only a 6 becomes a success. (The game actually comes with basic six-sided dice, but you can buy specialised dice sets that are really nice, and have elder signs on the 5 and 6 sides, denoting the successes, as well as Blessed and Cursed sets). 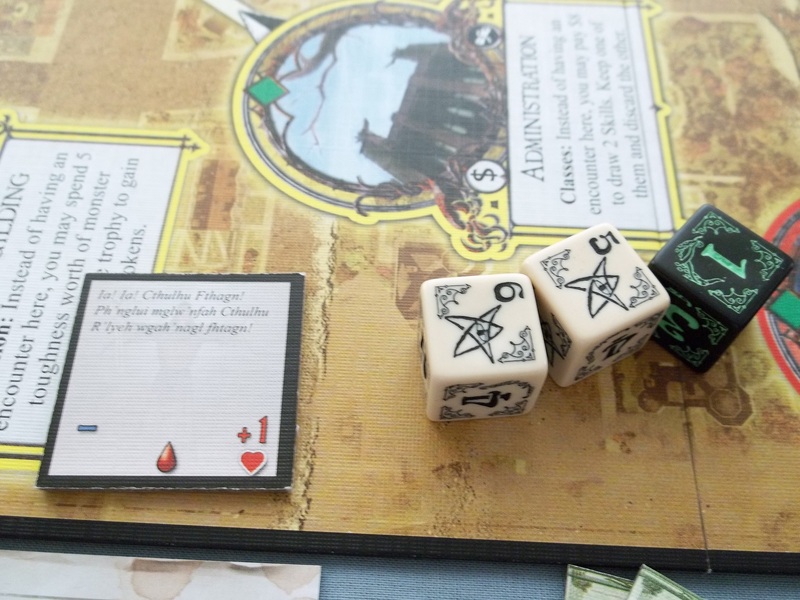 To begin, the investigator makes a Horror check against a modifier on the left of the token (although the above monster, a Cultist, doesn’t have anything), using his Will attribute. If he is successful, all is well. If he fails, he loses a number of sanity points, which can potentially drive him insane. If not, he goes on to combat proper and makes a Combat check against the monster, using his fight attribute plus any items that might help. The number of successes rolled is compared to the monster’s health value (the teardrop shape in the centre of the token), and if it equals or exceeds that amount, the monster is defeated. If not, the investigator takes a number of stamina damage equal to the hearts in the bottom right, and if he survives, they do it all over again. If the investigator lands on a space with a gate, however, he is drawn through to the relevant Other World and encounters that place. Classic mythos locations such as R’lyeh, Yuggoth and the Dreamlands are represented. 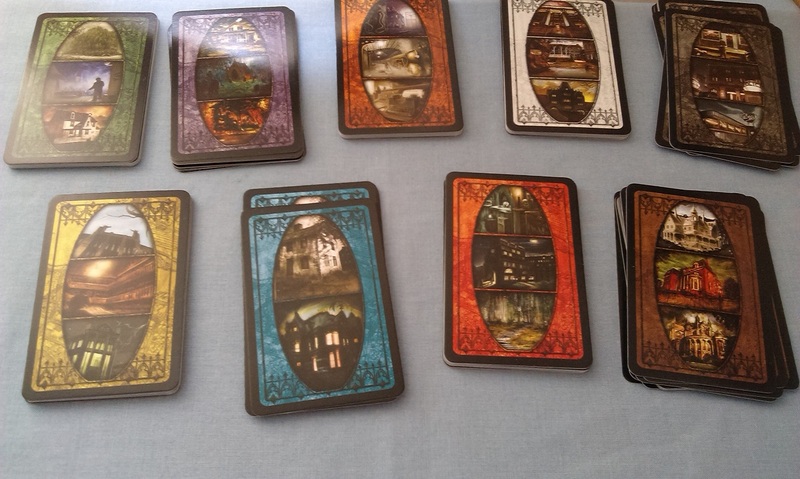 Each Other World is colour-coded, and the investigator draws cards from a Gate deck until he gets a card with the same colour border as his Other World, and follows the encounter from there (see above). The Other Worlds have two steps to them, so you have two encounters there before you return to Arkham and can then attempt to close and seal the gate. Either making a Fight check or a Lore check, using the modifier printed on the gate token, and if you’re successful, the gate is closed; if the investigator also spends five clue tokens to seal the gate, placing an elder sign token there which can prevent further gates opening. 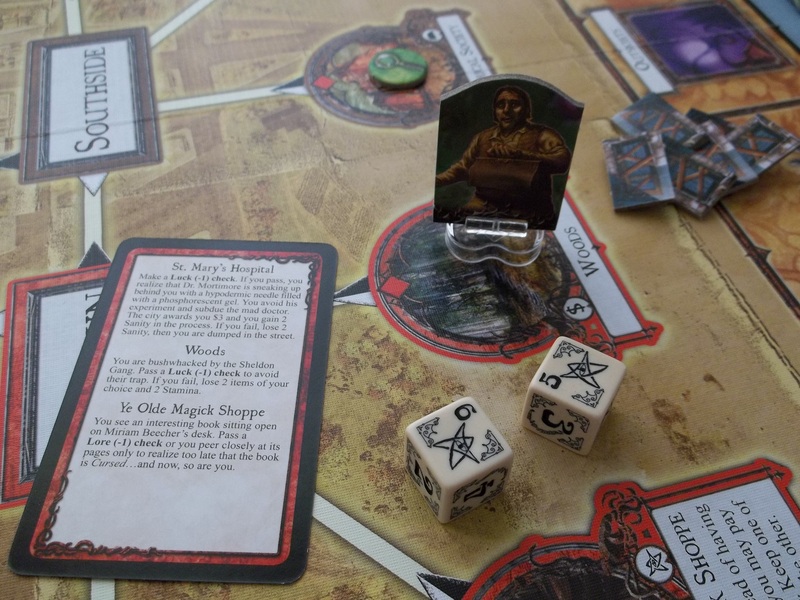 As soon as there are six elder signs on the board, the game is over and the investigators have won, preventing the Ancient One from conquering the world. However, if there are ever too many gates open on the board (for a two-player game, eight gates), the Ancient One awakens and the final battle begins! In addition, whenever a gate opens, a doom token (the other side of the elder sign tokens) is placed on the Ancient One’s doom track, and if this fills up the Ancient One awakens. 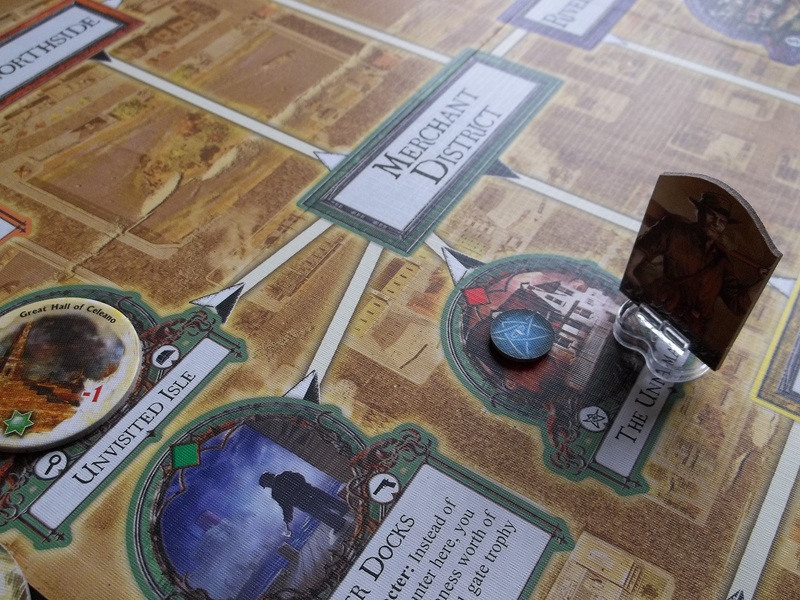 During the final battle, the investigators attack first, using the modifier printed on the left of the God’s sheet, with every success removing one of the doom tokens from the track. Once they’ve all had a bash, the Ancient One himself makes an attack as detailed on the right of the sheet. 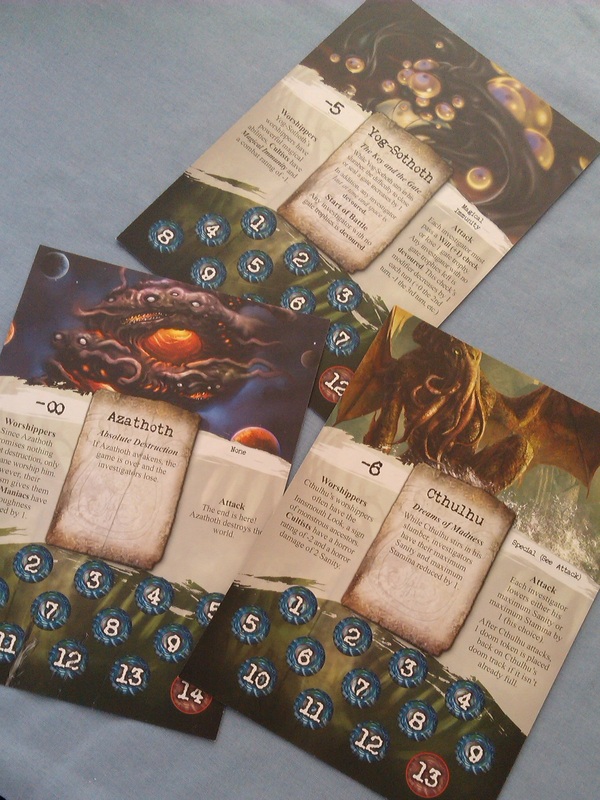 The Great Old Ones have one or two effects that last throughout the game, some of them affecting Cultist monsters, some of them affecting the game in other ways – for instance, Cthulhu reduces the maximum sanity and stamina of investigators; Yog Sothoth affects the difficulty of closing gates; Hastur demands more clues for sealing gates, etc etc. In addition, there is a Start of Battle effect that can sometimes cause investigators to be eliminated, such as Yig, who Curses every investigator, and those already Cursed are devoured. Should the investigators manage to remove all the doom tokens, they win; if the Ancient One defeats the investigators, the space-time continuum ruptures, the Ancient One is unleashed, and all of mankind suffers for the investigators’ failure. Arkham Horror is one of the classic greats of boardgaming, and frequently cited as the archetypal “Ameri-trash” game. That is, a game that emphasizes theme over mechanics. Basically a dice-fest with lots of cards and tokens, I love such games! 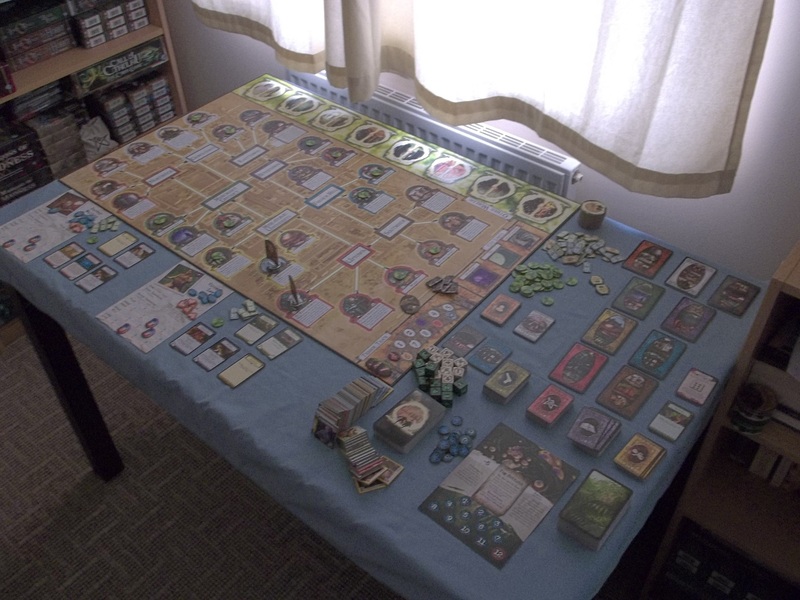 Arkham Horror was originally published in 1987, with the current third edition published by Fantasy Flight Games from 2005. Sold as “The Classic Game of Lovecraftian Adventure”, the game plumbs the depths of the Cthulhu mythos, not confining itself just to the works of HP Lovecraft alone. While the investigators are invented archetypes (the doctor, the professor, etc), the Ancient Ones and allies and whatnot all stem from the writings of Lovecraft and the stable of writers who contributed to the mythos over time. The game is set in 1926, with lots of period stuff in the items, and a whole host of eldritch artifacts including the dreaded Necronomicon. Something I particularly like about this is the theme. I’ve mentioned it before, of course, but I’m a really serious theme player, and this game has got theme in spades. A lot of effort has been put into tying everything into the whole, so that you can really immerse yourself in it all. I appreciate a lot of the small things, from the fact that the currency of the game is actual dollar-bill tokens, the fact that item cards have a “hand limit” (shown in the bottom left of the cards), showing how many items you can use at any one time. While the investigators are ‘made-up’ characters, the allies come from some of the stories, including John Legrasse from The Call of Cthulhu and Thomas Malone from The Horror at Red Hook. The investigators allow for greater RPG-style playing, too, seeing as how they are not essentially a part of the mythos. If I were to make any criticism of the game, it would be that it tends to be a bit too formulaic. You need five clue tokens (usually) to seal gates, and you need to seal six gates to win. So you basically need to charge around the board collecting clues, then dash off through to the Other Worlds and come back. There is very little in-built interactivity for a cooperative game. All of that said, however, the level of mechanics involved does actually help to tell some really good stories in the true RPG style, as once you’re familiar with the rules of play, you can sit back and concentrate on telling the story of what’s happening rather than constantly looking-up rules. Don’t get me wrong, I still play with the rulebook close at hand, but after a couple of games you don’t need it that much. One of the great myths of these sorts of games – particularly, in fact, of Arkham Horror – is that they’re far too complicated and not worth the aggro. While it is to an extent true, as evidenced when I call this one of the more serious of “serious games”, it isn’t really difficult to pick up after a game or two. The constant fluctuations of the six attributes of each investigator can sometimes make things confusing, as the amount of dice you rolled to make a certain test last time might not be the same as the amount you roll this time, etc. But the cooperative nature of the game can mean that help should always be available. The fact that the gameplay is formulaic is therefore a positive and a negative. There have been a number of novels published by Fantasy Flight that are set in the Arkham Horror universe, featuring the investigators as major characters. There are currently eight such novels, though I’ve only currently read the Dark Waters Trilogy. There has been some unfortunate criticism about these novels as being sub-par, but I thought they were really good! Well worth getting hold of. And to be honest, the entire line of Arkham Horror products is worth picking up. There are a whole slew of expansions for the game, and while the last one came out three years ago, they’re still pretty much kept in circulation. A mix of big-box expansions that bring new investigators, Ancient Ones and new boards; and smaller boxes that bring new cards around a specific theme. I’ll be looking at these expansions over the coming months, so you can look forward to lots more blogging as the weeks and months go by! 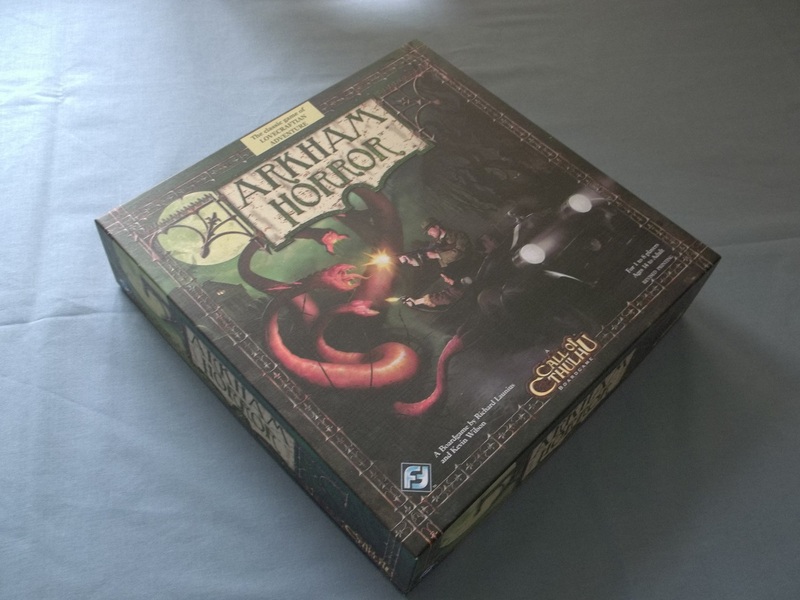 Author spalanzPosted on May 27, 2014 October 6, 2015 Categories board gamesTags Arkham Horror, board games, Fantasy Flight Games, game day, Lovecraft6 Comments on Come on down to Arkham! So, after my blog on the Dark Empire series, I’ve been feeling pretty bummed out. I think, more than anything, I feel like I’ve let myself down by being so derisive of what is often seen as a modern classic. It’s tantamount to blasphemy, almost! But anyway. I thought today I’d talk about another classic of the early years of Dark Horse comics publishing of Star Wars, the Tales of the Jedi saga. I’m quite the fan of these books, and read them fairly often, most recently in Feb/March this year, just outside the scope of this blog, hence I suppose why I’m writing this now. Anyway! Tales of the Jedi began back in the 80s, when Tom Veitch was pitching ideas for Star Wars comics to Lucasfilm. Initially refused, on the grounds that the franchise wasn’t going anywhere, it was only after the success of Dark Empire that the team managed to get some renewed interest in the idea. George Lucas himself apparently got very interested in the idea of a comic series set 4000 years before the film trilogy, and personally approved the storylines for each. Beginning in October 1993 with Ulic Qel-Droma and the Beast Wars of Onderon, the series would eventually run to 35 comics that told the whole story of Ulic from his days as a padawan, through his fall to the Dark Side, and his eventual redemption, alongside that of the unwilling Jedi, Nomi Sunrider. Further issues would explore even further back in the mythic past of the Jedi and the Sith. A year after the Onderon story began, the next arc of the saga came out, Dark Lords of the Sith. Opening the universe still further with the Jedi enclave on Dantooine, we are introduced here to the Jedi Exar Kun, who would fall to the Dark Side and unleash the terrible Sith War on the galaxy. Dark Lords of the Sith added the author Kevin J Anderson to the production team, who was currently working on his Jedi Academy trilogy of novels that dealt with the spirit of Exar Kun trapped on Yavin IV. With the comic series, Anderson was able to tell the backstory on this, slotting in his ideas neatly with Veitch’s, to create more of a homogeneous feel to the universe. 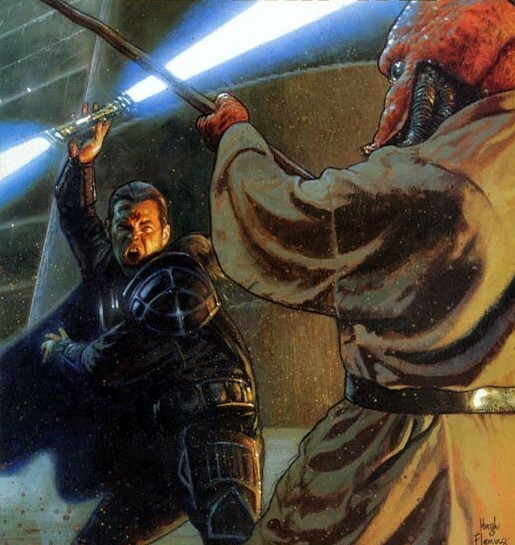 Despite Veitch’s departure from the project before the end, the series was brought to a suitable conclusion at the beginning of 1996 in The Sith War, before Anderson launched into a prequel story set 1000 years before the saga of Ulic, The Golden Age of the Sith. This was a universe still being discovered, where ancient Sith Lords were more like mad alchemical scientists. Featuring stories around Naga Sadow and Ludo Kressh, as well as Empress Teta and the Great Hyperspace War, not to mention lightsabers that came with backpack power generators, the universe really does feel like a mythic past in this and the following arc, The Fall of the Sith Empire, which concluded late in 1997. Finally, in summer 1998, the saga of Ulic Qel-Droma began its conclusion with the emotionally-charged Redemption arc. In a series spanning five years, the Tales of the Jedi finally reached their conclusion. I really enjoyed this series. 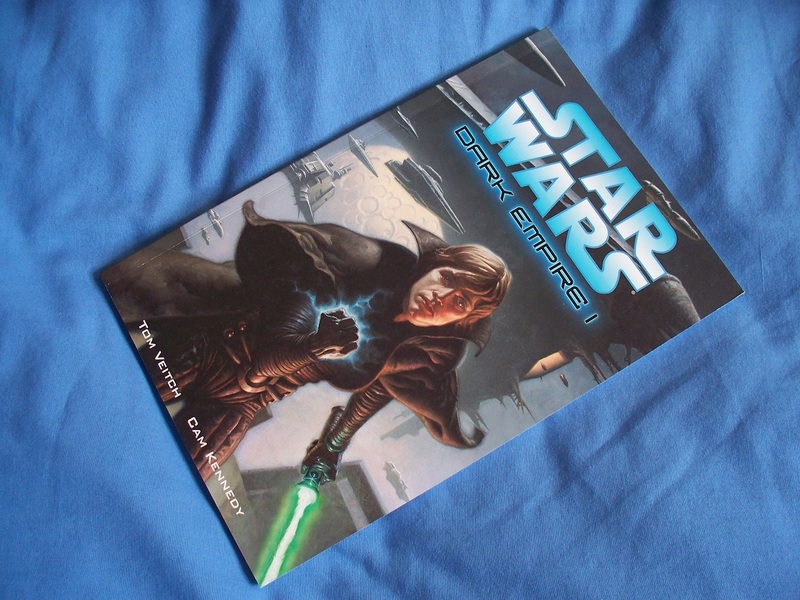 The core of the saga, which follows Ulic on his journey from Jedi apprentice to Sith apprentice, through being stripped of his Force powers and finally to his redemption, is really nicely done. Despite the fact that Ulic falls to the Dark Side in a misguided attempt to learn its secrets and thus to defeat it from within, I still think this is a much better tale than that eventually told by the Star Wars prequel movies. It’s also a lot better than the execution in Dark Empire of Luke’s fall, but I won’t go over that again. There are all sorts of things in these ‘early’ stories, perhaps most notably the idea that anyone can be trained to use the Force, back when the idea appeared to be more in terms of a mystical religion than a biological phenomenon. Satal Keto and his cousin Aleema are described as “bored aristocrats” with no particular affinity for the Force, and yet through the power of the Sith amulets they find, they are able to control the mystical energy field. Hm. Personally, I prefer this view as being much more, well, sensible. But anyway. The key to success with any Star Wars story, for me, lies firmly between boldly-drawn characters and epic situations, and the whole saga has that. Even what are, I suppose, the bit-players are really compelling characters, including Shoaneb Culu, the first Miraluka to appear in the universe (perhaps more famous examples include Jerec from Dark Forces, and Visas Marr from KOTOR2). The series is made increasingly rich as we follow first Ulic and then Nomi on their very different paths through the Jedi way. From the beginning, we have incredibly compelling situations, as Ulic, his brother Cay, and the Twi’lek Tott Doneeta travel to Onderon to help mediate in the Beast Wars. Some epic storytelling, including incredible reversals, launches the galaxy-spanning epic. By the time we’re introduced to Exar Kun, the figures of Ulic Qel-Droma and his companions already have something of a celebrity feel about them. By the end of the series, we feel like we know these characters as well as the films of the original trilogy. I don’t often mention the art when I’ve looked at comic books in the past, largely because I’m not really that much of a connoisseur. 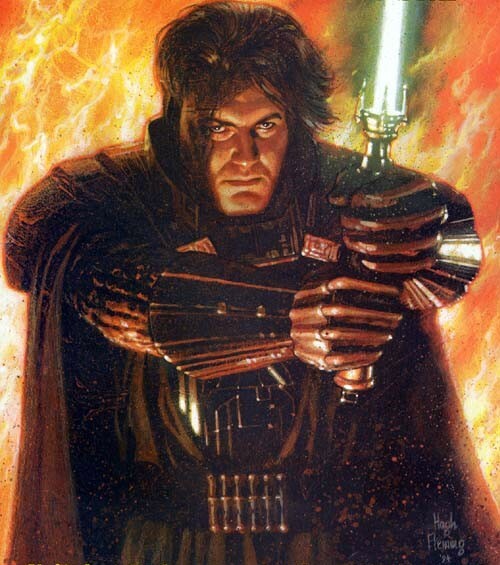 However, I have to say that I absolutely love the art of Christian Gossett, who drew most of the Dark Lords of the Sith arc, and whose art was, for many years for me, synonymous with Star Wars comics. 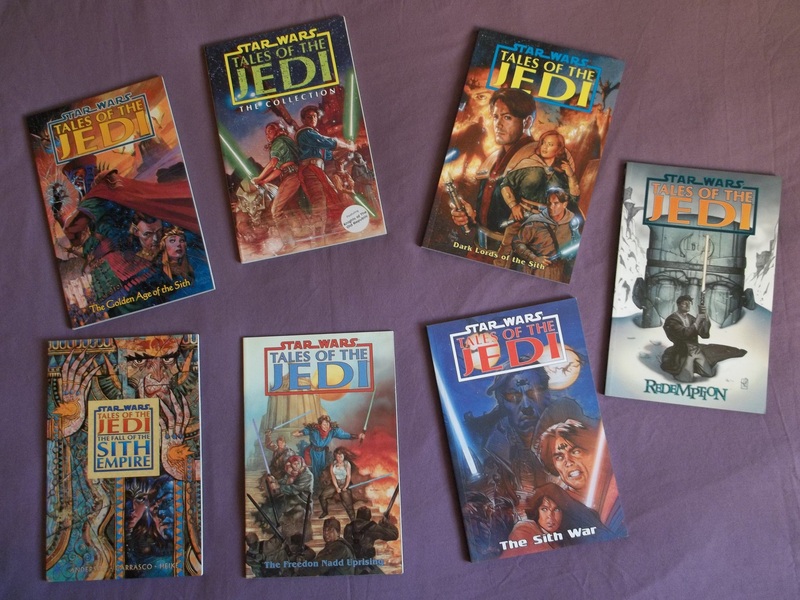 Of course, having grown up with the Bantam books, and the Jedi Academy trilogy were among the first that I’d read, when I eventually got into the comics and started to read these stories, they really were like reading the long-lost history of the galaxy. Reading about Exar Kun’s exploits when I’d only previously known him as a disembodied spirit wreaking havoc on Yavin IV, that was particularly gratifying. Somehow, the names of these characters and locations have a mythic feel to them, too – Ulic Qel-Droma, Nomi Sunrider, Arca Jeth, Vodo Siosk-Baas, Satal Keto, Freedon Nadd, and of course, Exar Kun himself. While we have the classic Yavin IV location, which explains what those jungle temples the Rebel Alliance were using were all about, we also visit Dantooine, but also have new locations such as Onderon and the Dxun Moon, the Jedi training centre on Ossus, and the Sith ‘homeworld’ of Korriban. All of these things are so intrinsically part of Star Wars lore that I can’t help but feel like it’s part of something really special. Aside from the Jedi Academy trilogy, the events and situations were most strongly referenced in the later Dark Empire stories, where Leia takes refuge on Onderon to escape the Emperor’s attempted kidnapping of her son Anakin. In later media, the novel Darth Bane: Rule of Two features a trip to Onderon in a sort of pilgrimage to find the tomb of Freedon Nadd. The Sith stronghold of Ziost plays a significant part in the Legacy of the Force novel series, while Korriban, as a sacred world to the Sith Order, features strongly in pretty much any story where the Sith are prominent, either by name or an actual appearance. Perhaps the greatest homage was paid by Lucas himself, however, when he modeled Darth Maul’s twin-bladed lightsaber on that of Exar Kun. Before the advent of BioWare’s Knights of the Old Republic reinvigorated interest in the ancient history of the Star Wars universe, Tales of the Jedi sat apart from the rest of the canon, which centred around the original trilogy and, as the prequels came out, ventured no further into the past than forty or fifty years before A New Hope. But now, there’s all sorts of stuff going on at that end of the timeline, including even earlier stories, Dawn of the Jedi. It’s a really great series of comics, and I can heartily recommend you take a look! 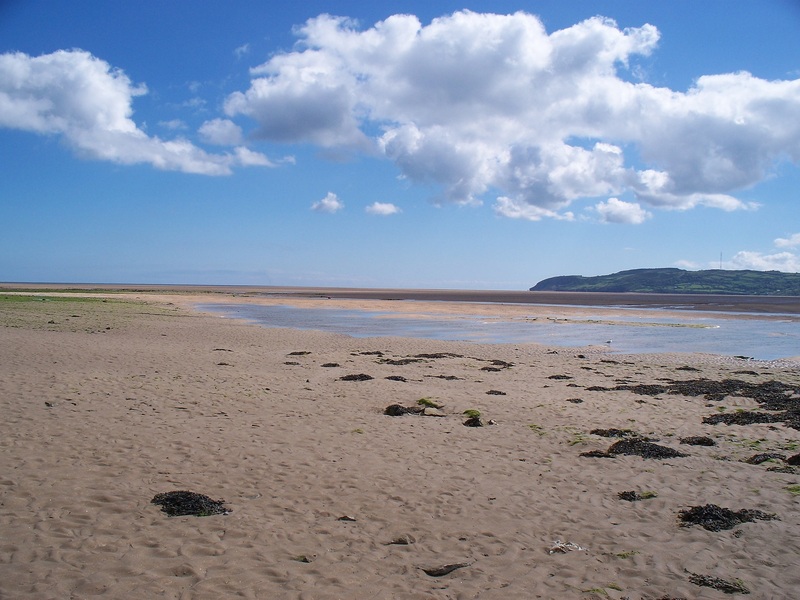 Welcome to my latest blog, a little bit of odd jollity for a Saturday! You know you love it. It’s been another exciting week, as you may have seen from my blogs posted over the past few days. 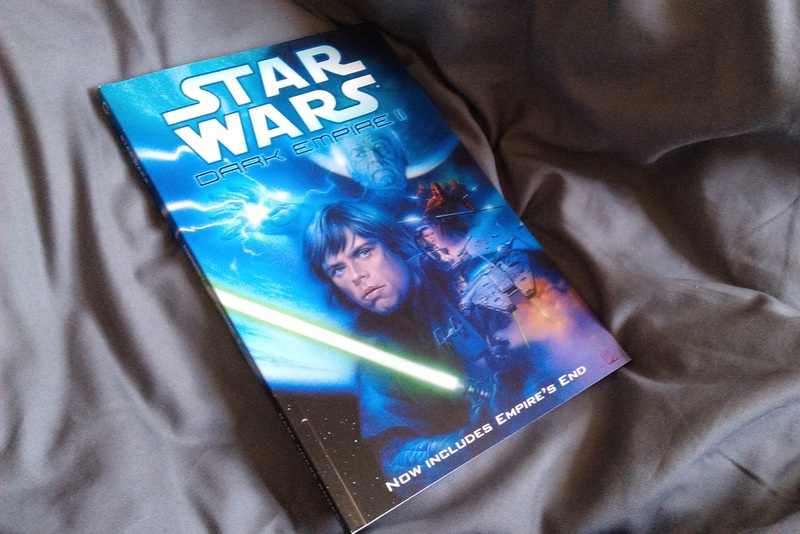 Perhaps the most exciting event was finishing the Thrawn trilogy, which is always good. In case you hadn’t picked it up by now, I’m a really big fan of Tim Zahn’s work! This morning I finally got round to the short story Heist that was published in the Star Wars Insider magazine. A prequel of sorts to the novel Scoundrels, which I read just before Easter, it features the ghost thief Bink Kitik and her sister Tavia on a job. It’s all pretty standard stuff, nothing earth-shattering or anything, but it’s a good tale, and well worth it if you can still find it. 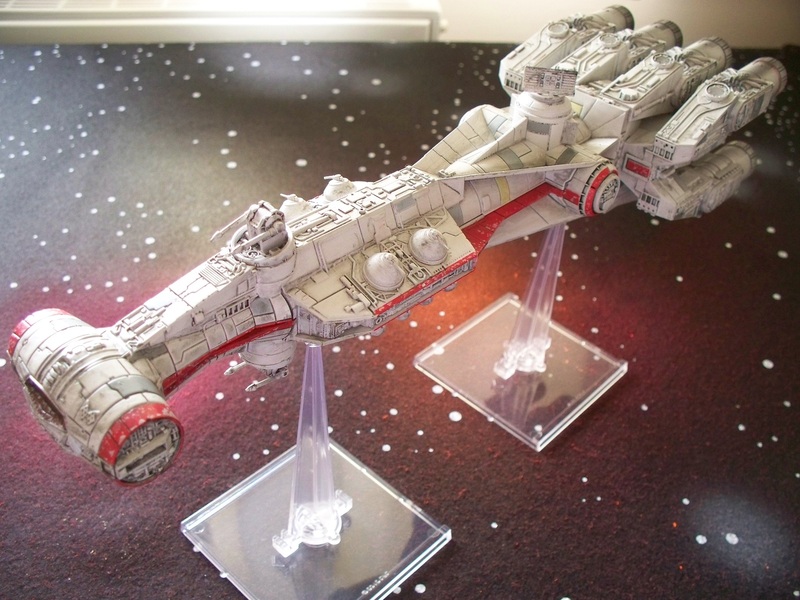 The most exciting thing to happen this morning, though, was the massive delivery of another of the huge ships for the X-Wing miniatures game: Tantive IV! 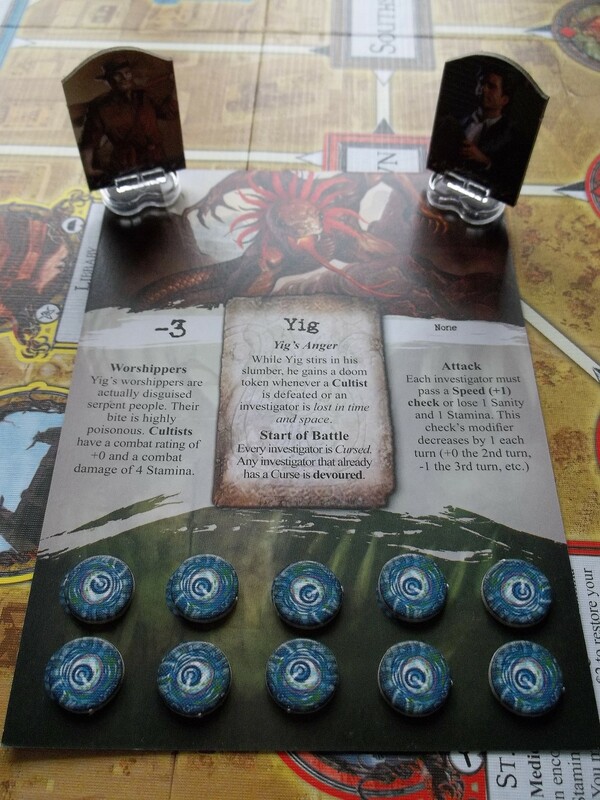 Remember Yig, the new Ancient One in the expansion for Eldritch Horror that I received just over a week ago? Well in addition to reading the classic Lovecraft Call of Cthulhu the other day, I also read the Curse of Yig collaborative tale. It’s a pretty good story, actually – unlike quite a few of the Lovecraft tale I’ve read, this one feels very much like a modern horror story when we come to the end. The tale of a couple who move out west to start a new life, where they encounter the local stories of a snake-god who punishes anyone who kills the indigenous snakes, it very much reminded me of the sort of horror films that begin pregnant with expectation, and culminate in something truly horrible at the end. It’s available in The Horror in the Museum, a collection of other collaborative stories, definitely worth investigating! Especially for fans of the many Cthulhu-themed games. Some cracking news this week, the Carcassonne android app has been updated, and finally we have some of the expansions! Not all of them, sadly, but hopefully this will be the start of seeing more available soon! It’s a bank holiday weekend in the UK here, and as per tradition, it’s been pouring with rain all day. Also as per tradition, I’m having a bit of a boardgame weekend with that old favourite, Arkham Horror! Stay tuned for more on that soon! Hey everybody! Welcome to more musings and ramblings on my favourite theme, Star Wars! Today I’d like to muse and ramble about the comic series Dark Empire, which was the first title to come from Dark Horse Comics all the way back in 1991. *sigh* I’m just going to say this, because there’s no mincing about needed here: I don’t like this comic. That might make a lot of you instantly stop reading this post and un-follow me, which is sad, but I can understand. The comic is seminal in terms of the meta, being the first thing produced by Dark Horse. It’s also had the Lucas stamp of approval (apparently), so could have been quite strongly considered as high-level canon until the recent announcement. But there are several issues that I have with it, which ultimately prevent me from enjoying it. The series has been widely criticized, however, for bringing Emperor Palpatine back, thus negating the sacrifice of Darth Vader at the end of Return of the Jedi. Furthermore, in light of the prequels, bringing the Emperor back proves to be an even worse mistake because of what Vader/Anakin was supposed to represent, the Chosen One who would destroy the Sith and bring balance to the Force. Of course, there is a whole argument about the need for the Sith if the Force is to actually be balanced, but I won’t get into that right now. Vader died destroying Palpatine, and yet here we learn that is was a pointless exercise. What’s more baffling is why didn’t Vader know about Palpatine’s clones? Vader, who was the Emperor’s loyal enforcer and apprentice for 23 years, didn’t know about Palpatine’s contingency plans, and yet Luke, who just says “okay, Palps, I’ll join up with you” gets to learn about such a massive weakness within five minutes? Especially when the Emperor later reveals he expected Luke was going to try to betray him? Something seems off there. However, apparently, George Lucas himself approved the idea of bringing Palpatine back through cloning. Assuming this to be true, and we have to have a story about a resurrected Emperor and whatnot, I still feel that the execution of the story is quite poor. Part of this, though, could be due to similar limitations as Heir to the Empire. Dark Empire was initially pitched as a story idea to Marvel Comics in the 1980s, but was ultimately turned down until Dark Horse were offered the licence. By then, Bantam were getting Tim Zahn to write the Thrawn trilogy, so some details had to be shifted around, notably the story was moved to 6 years after Return of the Jedi, rather than much sooner after the film – Zahn famously refusing to reference any of the events of the series prompting its placement in the timeline after his books. That said, it still had very little to go on, and the first six issues that form ‘Dark Empire I’ really feel quite lost somehow, like they’re not part of the continuing storyline. Where Zahn strove to insert his story and characters into the history of the universe, providing hints of events that had taken place in the five years between the sixth film and his book, Dark Empire seems to take a step back, and there seems to have been no effort to really dig into the backstory at all. It’s a shame, because there are some really interesting ideas and situations that are presented over the course of the three story arcs. I categorically refuse to advocate Luke turning to the Dark Side, of course – indeed, the one thing that I can find to appreciate in that particular situation is that, once he’s there, he doesn’t really seem to do that much ‘evil’, which makes you wonder if he did actually shift allegiance at all. However, accepting the return of the Emperor, I thought the idea of him using the Dark Side of the Force so much caused him to rapidly decay, hence the need for clones, into which he transferred his consciousness when required, was entirely fitting for such a devious and manipulative man. Indeed, the idea of the Dark Side causing one to decay from the inside out is a much better explanation of the Emperor’s aged condition in Return of the Jedi that is the fact that he melted his own face when duelling Mace Windu. It also ties in to the idea that was to resurface in the Tales of the Jedi comics that would come out later, of Sith power being based partially on alchemy and twisting the forces of nature. I also like the idea of him having a cadre of Dark Jedi, although the idea presented in Dark Empire II of the Emperor being able to ‘imbue’ what appear to be ordinary people with the Force seems definitely counter to what we now know to be the case, midichlorians and whatnot. 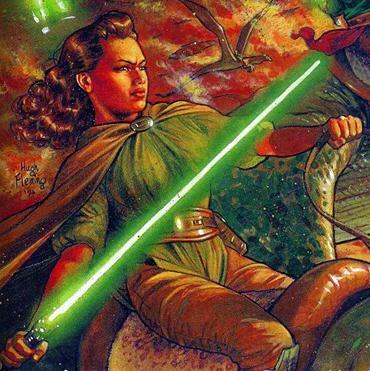 Whereas Mara Jade is acknowledged to have a rudimentary Force ability that the Emperor amplified through his power, these other Dark Siders seem to be given that power much like one would confer a battlefield promotion. It seems a bit odd, to say the least. But Dark Jedi, yeah, that’s a nice idea. And indeed, it’s one that later sources have taken up. When Obi-Wan tells Luke that Vader helped to destroy the Jedi, it turns out he was being figurative in a sense, as he did manage to turn some to the Dark Side to serve as Adepts. It’s a cool idea, that there are two really badass Sith out there, but they also have this army of other Force users, nowhere near as powerful, but powerful enough. It’s also an idea that turns up much later, in the Clone Wars era comics with Count Dooku and his adepts. Leia has a third child in the course of the series, which has always struck me as a bit odd. Zahn gives the Solos twins, and given how she never gets to see her kids because of the pressures of state, why would she want another? Maybe I have this view because I’m not a mother (obviously), but I’m more inclined to think that this is a holdover from the initial 1980s pitch, and was just never written out. It’s a pretty important plot point, so I guess it makes sense – after Luke sabotages the Emperor’s clones, Palpatine transfers to the only one left, which turns out to be genetically unstable. Hearing of Leia’s pregnancy, he determines that he would be best taking possession of her baby’s body and thus having the powerful Skywalker heritage as well as his own dark power, which would make him even more powerful. Of course, it doesn’t work out that way, but never mind. I must admit, I think that plotline is wonderfully creepy, and should have worked out so much better than it eventually did – unfortunately, like a lot in this series, the execution just didn’t do it for me. There are more superweapons than you can shake a stick at in Star Wars, and that theme continues here with the World Devastators and the Galaxy Gun (I’m not joking). Both are a bit inept, though perhaps not as bad as the Eye of Palpatine from Children of the Jedi. I really enjoyed seeing Nar Shaddaa, the run-down, dingy spaceport moon that orbits the Hutt homeworld of Nal Hutta. It was good to see Han revisit his past, and having recently re-read the Han Solo trilogy, seeing Salla Zend and Shug Ninx for the ‘first’ time was a pleasure. Indeed, the smugglers are some of the best parts of the story as-is, for me. But…Boba Fett. Urgh. I’ve never been what you could call a Fett fanboy, and it’s gotten to the point now where everytime I see him pop up I just roll my eyes and sigh. When he was introduced in Empire Strikes Back (because I discount with vehemence that holiday special nonesense!) he was an interesting character, but popularity with the fans has led to this whole legion of insanity that has produced something like a cult of Fett, and now gives us these gratuitous appearances that often have no real bearing on the story. In the pages of the Dark Empire saga, this has never been more true – Fett tries two or three times to collect the ever-increasing bounty on Han and Leia, but fails each time. For the galaxy’s best and most-feared bounty hunter, he’s become quite the failure in that regard, and it’s all down to the fact that authors want to include him to appease the fanbase, but because it seems to have been an unwritten rule that Han should never be held accountable for dumping that shipment of spice, he never gets to collect. I don’t know how many times exactly now, but Fett has failed to bring in Solo so often over the years, his reputation in-universe should be in tatters by now. His purpose in Dark Empire seems to solely be to provide a sense of danger in Han returning “home”, but in reality, given the already-established bounty on Solo, literally any other bounty hunter could have provided that. Why not make a new one? It seems to be just laziness, always relying on the same person. Meh. But as I said, there is still a lot about Dark Empire that I like. While the execution lets it down, I nevertheless appreciate the ideas behind a lot of the situations. As the series gets going, perhaps around the mid-point of Dark Empire II, we begin to see that sense of history that the first series lacked. Luke has managed to redeem one of the Emperor’s Dark Jedi, Kam Solusar (albeit entirely ‘off-camera’), who has joined the ranks of the New Republic (at least I think they’re calling themselves that again by this point…), and the two head off to Ossus in pursuit of Jedi lore to help reestablish the Order. 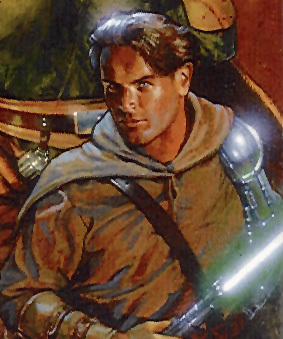 Ossus appears in the old Tales of the Jedi comics, and we begin to see ties in to that era now that the comics universe has begun to expand (Dark Empire II began publication in 1994). By the time of the third of the series, which came out in 1995, we’re seeing all sorts of stuff, including Korriban and Onderon – we even get the Beast Riders and see descendants from the earlier series! But again, it’s all let down by the execution. Empire’s End in particular seems to have been rushed, a common complaint and perhaps not entirely unjustified – whereas the first two in the series ran to six issues each, Empire’s End consists of just two. I feel really bad for being so negative about this comic now! What do you guys think? Tell me in the comments!